OAKLAND – What’s that saying, don’t poke the bear? Well, the Warriors poked the Grizzlies tonight and got away with it easily. 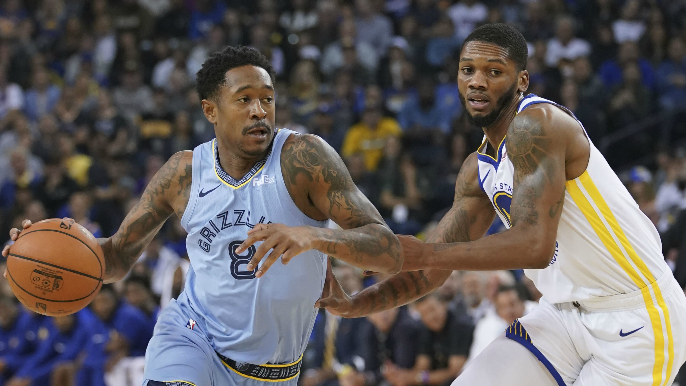 Still, the champs were faced with a unique, physically large challenge that – with a limited Draymond Green, sidelined Shaun Livingston and Andre Iguodala, and the foul-plagued Damian Jones and Jordan Bell – proved to be difficult to fend off for a half. That difficulty dissipated when the Warriors did what they did so often last year, and exploded late in the third quarter. Normally this season, the Warriors haven’t been able to dominate in third quarters like they have in the past, turning the ball over more than ever. That was not the case tonight, as the Warriors outscored the Grizzlies 34-15 in the third quarter. If you’re a team that wants to beat the Warriors, you have to be absolutely perfect and the Warriors need to be off. With sub-par 3-point shooting from the Grizzlies, and that fantastic third-quarter shooting from the Warriors, a slim lead quickly became a massive one, en route to a 117-101 win. It improved the Warriors’ record to 10-1 on the season. Alfonzo McKinnie came into this season relatively unknown. He was best-known for his jumping ability and length. Well folks, in case you haven’t been following, McKinnie is much more than an athlete with size. Tonight, he finished with 14 points, 3 assists, 2 rebounds and went 2-for-2 from 3-point range. On the season, he is 12-for-20 from three and has demonstrated a quick and intelligent trigger. After his last game, in which he set a career-high in minutes played, finishing with 8 points, 8 rebounds, and again, went 2-of-2 from three. He’s rebounded, defended and shot with starter-level quality and made Patrick McCaw’s holdout irrelevant and all the more confusing. The Grizzlies entered tonight as one of the most unique teams in the NBA. While everyone else is playing uptempto, shooting a preposterous and historic number of 3-pointers, the Grizzlies are grit and grind. Marc Gasol runs the offense out of the high post, setting picks for Mike Conley and throwing clever passes to cutters. Their backup center, Jaren Jackson Jr., was the third overall pick in the 2018 NBA draft and looks as NBA-ready as a 19-year-old prospect could possibly look. He’s athletic, can shoot and defend at the rim. While he’s not always getting starting minutes, when he joins Gasol on the floor, he presents a fundamental and massive problem for teams to defend. His ability to space the floor leaves teams needing to try and match the Grizzlies’ odd mix of size and athleticism. Their starting small forward, Kyle Anderson, has the nickname “Slo-Mo” – he bodies up, plays defense, passes and does all the fundamental, non-modern NBA things that you’d expect from a Greg Popovich-tutored player. By the end of the first place, the Grizzlies had six blocks and 32 points in the paint at the end of the first half. They shot just 29 percent from three, but sat tied with the Warriors 58-58. The Warriors couldn’t create separation until late in the third quarter, but when they did, they made those first-half struggles a distant memory. In his first nine minutes, Cook was 0-for-4 with three rebounds. That was it. But, as the game went on Cook started to heat up. He finished with 13 points 6 rebounds and 1 assist in 19 minutes after hitting four-straight 3-pointers in the fourth quarter. Bell got an extended look too, as Draymond Green picked up a right foot contusion early on. While he returned to the game, Steve Kerr opted to shut Green down in the second half. In his 18 minutes, Jordan Bell finished with 2 points, 2 rebounds, 2 assists and 5 personal fouls. His role looks like it will remain diminished as Jonas Jerebko continued to impress tonight. Jerebko had 7 points, 6 rebounds and 3 assists along with a three in one attempt tonight. Jones, who has generally played well this season, was very poor tonight. His main issue – fouling too often – caught up with him. Jones had five fouls in 11 minutes and after his fifth foul, he failed to get back on the court. It was a concerning display against one of the best big men in the league in Marc Gasol. Gasol handled Jones with ease, leading to Jones’s non-factor stat line of 5 points, 2 rebounds and 1 assist. If you watched much of the Warriors’ regular season campaign last season, you saw plenty of Omri Casspi. The Israeli wing played in 54 games for the Warriors last year, averaging 14 minutes, 5.7 points and 3.8 rebounds per game. When Quinn Cook was signed, Casspi was shown the exit door. Before the game, head coach Steve Kerr credited Casspi’s professionalism despite the way his role was eventually diminished, and he found himself cut from the team. For more Warriors videos click here.